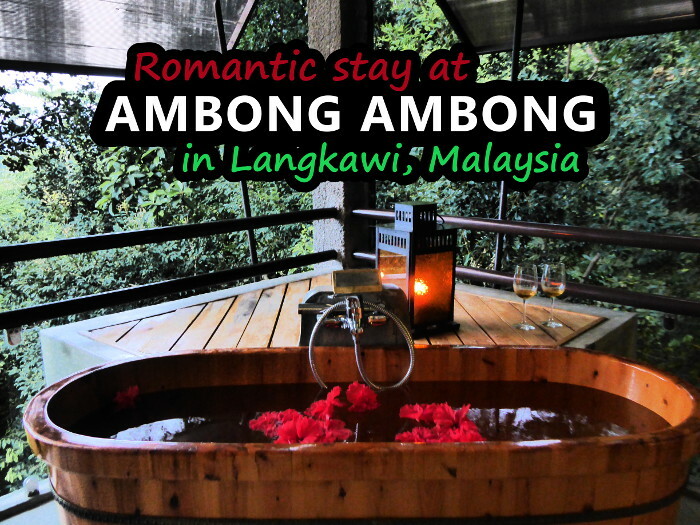 The Ambong Ambong in Langkawi is situated in the middle of a lush green rainforest and makes the perfect romantic retreat for gay couples, nature lovers and honeymooners. The resort is named after the medicinal plant ambong, native to Langkawi and the surrounding jungle area of the Ambong Ambong resort. On arrival, we were greeted by the very gay friendly and professional staff. Everyone knew our name and who we are (ie a gay couple) and made every effort to ensure we felt welcomed. The chilled white wine made a very refreshing welcome upon our arrival. The check in process was extremely unique. The staff at Ambong give all guests a mobile phone to use to contact them for any questions or concerns. This is the first time we've ever encountered a hotel who offers this service to its guests! The resort has its own driver, Mr Lee, who is on hand to take you anywhere on the island. Mr Lee is a blessing to those who may find the steep climb up to the suites a bit challenging. He is only a phone call away and will drive you up and down as many times as you want without making you feel put out in any way. The suites at Ambong Ambong are like private love nests tucked away in the middle of the jungle. 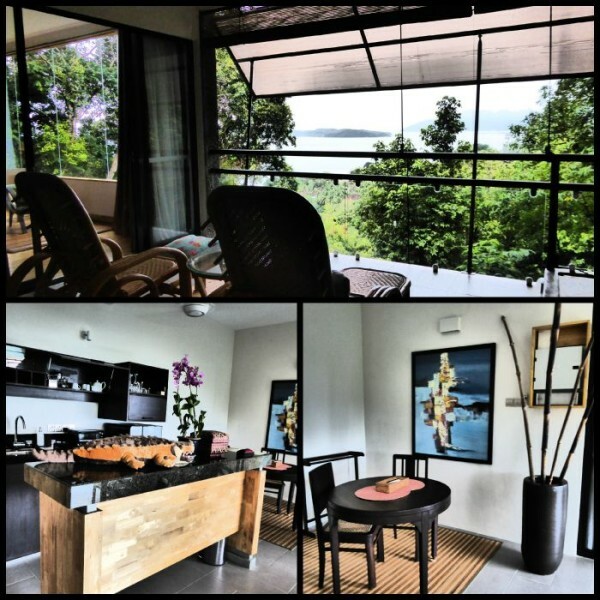 Our suite included an open plan space for the kitchen, dining area and balcony overlooking the surrounding rainforest. This open plan space was designed not to have closed windows, making you feel like you're outdoors in the middle of the surrounding jungle. And if you didn't think it could get any better…our outdoor room area also included a large wooden bathtub: perfect for enjoying a romantic evening with a glass of champagne or a pot of peppermint tea! 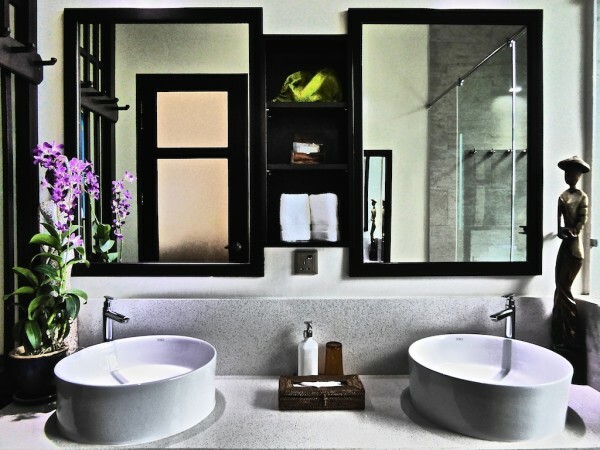 When we entered the room, our eyes were instantly drawn to the towel arrangement romantically decorated with flower petals. And Sebastien does love his flowers! The bedroom also has a large bay window with a stunning view overlooking the surrounding rainforest and Andaman Sea…this is what you wake up to! The bathroom includes a walk in shower with powerful pressure. Sometimes the neighbouring monkeys peep inside – they see their reflection in the glass panels outside and think it's another monkey inside! There are plenty of activities at Ambong Ambong. 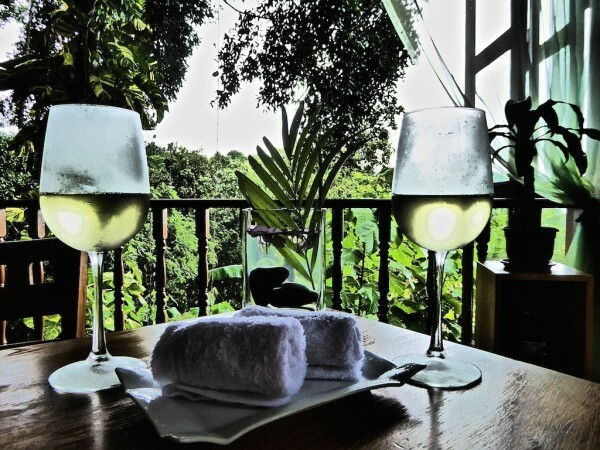 They have a spa for romantic massages and a large space for yoga retreats and even cooking classes. As foodies, we were delighted to have a cooking class with the famous Malaysian celebrity Chef Anuar at Ambong Ambong. 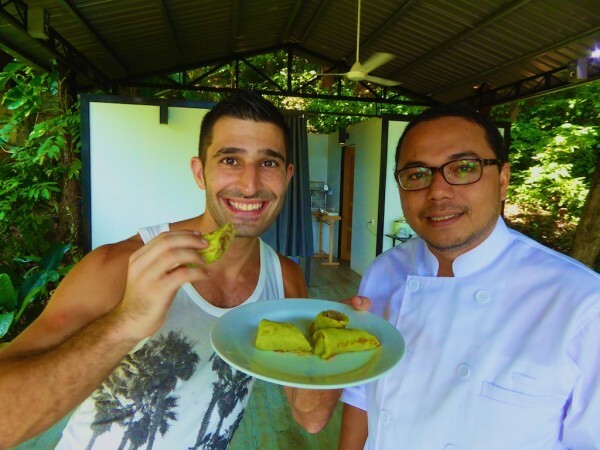 We learnt to cook fish cakes wrapped in banana leaves, chicken rendang and pandan pancakes. The Ambong Ambong also has an excellent herb garden, which is great for finding ingredients to make a home made mojito. 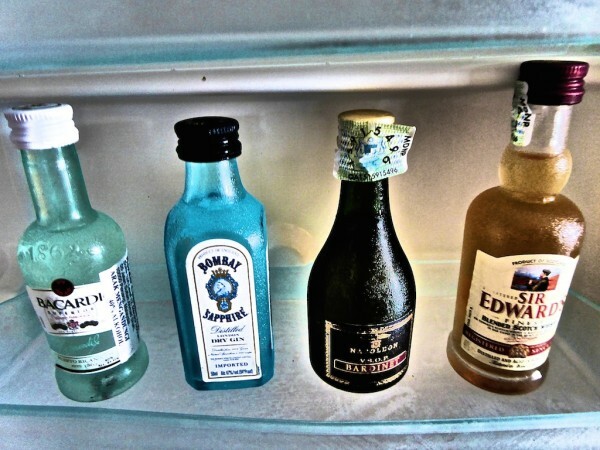 All guests are given a small selection of alcohol when checking in which includes rum. Add some fresh mint from the herb garden, fresh lime from the staff, buy sparkling water, sugar from your kitchen area and ice from your fridge, mix, and voila! For fitness enthusiasts, the Pantai Tengah beach is minutes walking distance which is great for morning jogs and early morning swims. 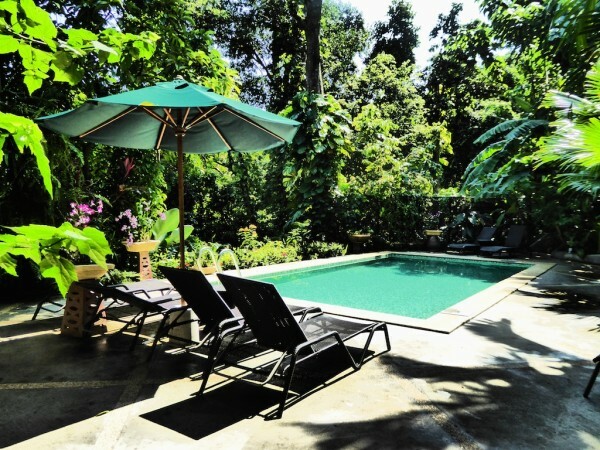 The small pool area of Ambong Ambong area is like an enclosed, hidden paradise space, perfect for enjoying a morning coffee. Ambong Ambong was one of our favourite places we stayed during our travels. The entire set up is made for privacy, romance and relaxation. 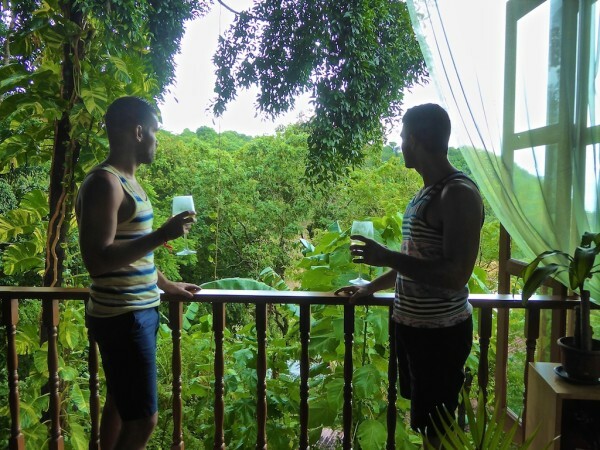 The service is first class without seeming false, we were not made to feel awkward about being a gay couple and your privacy is completely respected. We cannot recommend it enough! Read more about them on their Booking.com listing. The stunning view from Ambong Ambong which we will miss a lot!